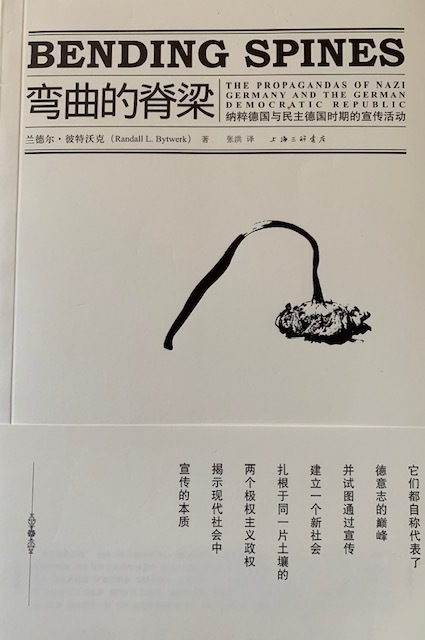 Back in 2012 a Chinese translation of my book Bending Spines: The Propagandas of Nazi Germany and the German Democratic Republic appeared. Shortly after publication the Chinese government ordered the publisher not to distribute further copies. About a year after that, the ban seems to have been lifted. A Chinese contact tells me that the ban is again in force and that the book is again unavailable. Some copies did circulate and there are a variety of interesting comments on Douban, a Chinese book site. The Chinese government exerts substantial control over what can appear, both in print and on the Internet. A reader of this blog informed me that copies of an atlas were seized from his school, since one of the maps depicted Taiwan in a different color than the People’s Republic of China. I was surprised that the book was published in China to begin with, given its suggestion that Marxism-Leninism (and by extension its Chinese variant) were comparable in some ways to Nazi Germany. I’d welcome further information from any Chinese readers. 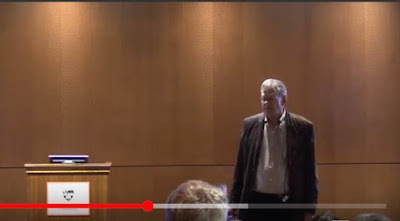 Late in the war the Nazis revived an old propaganda method, the discussion evening. These were to be gatherings where party members could discuss the themes of the day, then transmit the material to others. I’ve got a variety of such material on the site, and have recently added late-1944 material about what to say regarding the United States. The problem the system faced is that people didn’t need to be persuaded to fear the Russians, but many Germans thought victory by the Western allies wouldn’t be nearly as bad. 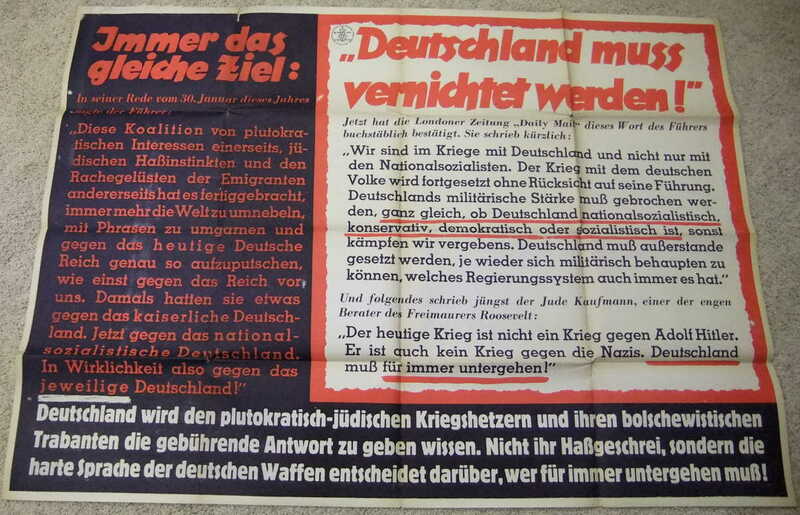 This material is an example of Nazi attempts to combat that view. Julius Streicher was convinced that there was an international Jewish conspiracy involving every single Jew on the planet. Today I’m adding a 1942 article that asserts a Jewish gathering in Moscow provided proof of that conspiracy. The orders from Jews in Moscow allegedly would be followed by their racial comrades wherever they might be. I’ve added two Nazi magazine articles from September 1940, published at the height of the Battle of Britain. The first, titled “Why London Is Burning,” argues that England is only getting its just desserts for having violated the laws of war in fighting Germany. The second, published two weeks later, “The Delayed Invasion,” explains why the fact that England has not yet been invaded is of no significance since England is doomed, invasion or no invasion. Both articles were probably written by German propagandist Hans Fritzsche. They were the lead articles in Das Reich, the prestige German weekly. Goebbels usually wrote the leads, but for the period June-December he did not, probably because Das Reich was new and payment details had not yet been worked out. Goebbels liked to be well-paid. The book, by the way, is worth reading. I made the mistake of ignoring developments in web design, most notably Google’s insistence that web pages be “mobile friendly.” That is a good idea, but it requires me to make a variety of changes to the over 700 pages on the site. I am about 80% done with the process. The remaining pages will take a little more work. But in the meanwhile, I may have made an error or two in the revision process. If you come across a significant error in page display, I’d appreciate it if you’d let me know (bytwerk@gmail.com). Goebbels prided himself (not always accurately) at telling the truth, or at least as much truth as was useful under the circumstances. Up until the Battle of Stalingrad, propaganda was relatively easy to make. True, there were occasional setbacks, but he would point out that was to be expected in war. By early 1945, he could no longer speak of occasional setbacks. The Soviets had begun a major offensive on 12 January 1945 that quickly overran German positions and took them across the German border of 1939, Germany was now fighting on German soil (and the Western allies were on German soil to the west). In an essay dated 11 February titled “A People on the Defensive,” Goebbels admits the military situation is grim, but still makes empty arguments that Germany will win in the end if only it steadfastly continues the war. His promises were empty and by then most Germans realized that the war was lost, but the one effective argument Goebbels had was fear of the Soviets. This article discusses only the Soviets, not even mentioning the presence of Allied troops on German soil to the west. Nazi racial laws got complicated, sometimes leaving people in distressing situations. Today I’m adding a Q & A column from Der Hoheitsträger, a Nazi monthly for party officials at the local group leader level and above. It deals with such awkward issues as what to do if a city employee discovers that his wife is half Jewish. The answer: divorce her or resign the job. 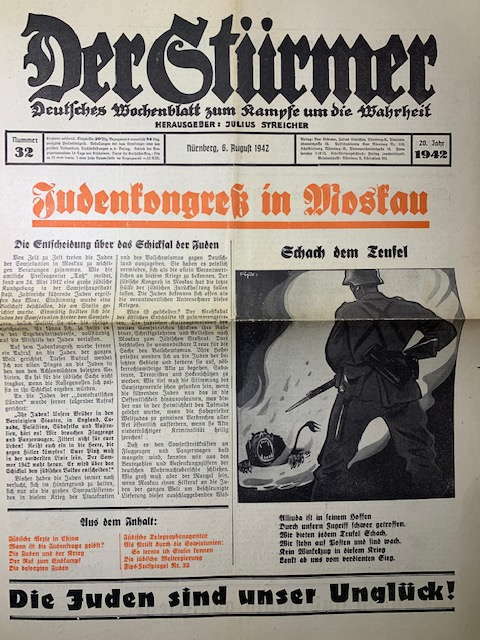 The Parole der Woche was a weekly “wall newspaper” issued by the Nazi Party. 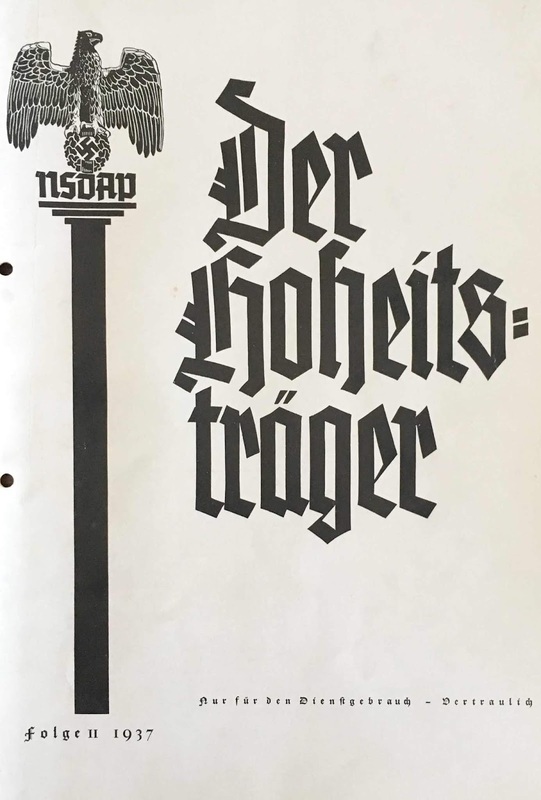 There are a variety of examples on the German Propaganda Archive. 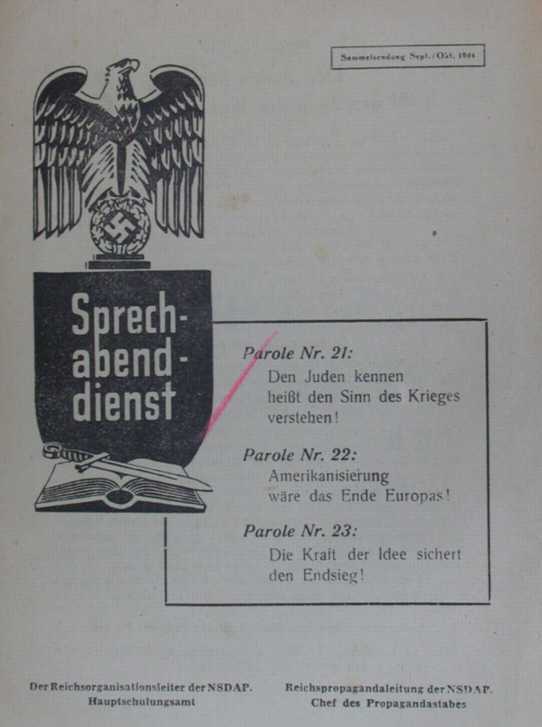 The issue below is from 1940 and promotes the idea that World Jewry was out to destroy Germany. 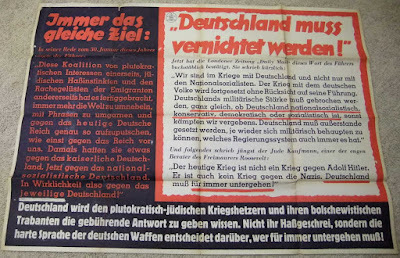 Today I am adding a 1940 article from Unser Wille und Weg, the monthly for propagandists, that encourages greater use of the poster. Old editions were not to be discarded, but reposted in different locations.